The best part about watching a horror film is that no matter how grisly and gruesome it gets, you can still tell yourself that it's all just make-believe. That is, unless the terrifying scene is happening to you in real life, too. 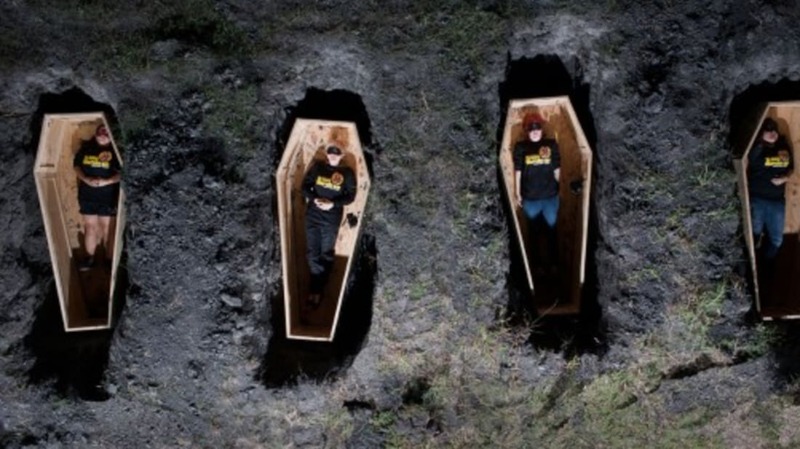 That was the case recently with four horror film fanatics that won the unenviable right to view the premier of Buried – a film that features a main character who spends the duration of the film buried alive in an underground coffin. So what's so unenviable about winning the chance to attend a movie premiere? To see the movie, the four lucky individuals were blindfolded, driven 30 miles outside Austin, Texas, and buried in a specially-constructed coffin that featured an LCD screen built into the lid. Once inside the coffin, the four individuals were free to remove their blindfolds and view the film. I can’t imagine a movie that could possibly be worth that. But, I know that I’d love to attend a screening of The Shining at the Timberline Lodge, where portions of the film were shot. Or maybe watch The Shawshank Redemption at the Ohio State Reformatory where Andy & Red spent so many years. What about you – what would be your ideal movie screening scenario/location?